"Rumi has always been a healer of the spirit"
Shems Friedlander in his book, The Whirling Dervishes mention from Rumi's life: It was Seyyid Burhan al-Din Muhaqqiq, a dervish, a close friend and disciple of Rumi's father in Balkh who devoted his later part of his life to the spiritual training of Jalalu'ddin Rumi. For nine years Rumi was initiated into the knowledge possessed by the prophets and saints entitled: The Science of Divine Intuition. Rumi had the ability to trace a man's past and read his future by experiencing his presence. The power of zikr (remembrance of God) developed the healing power of his voice so that the vibrations and breath that accompanied his words had a healing effect on those being addressed. Often during a zikr circle (of Mevlevi dervishes), a deputy sheikh would walk in the inner part of the circle carrying an open bottle of water and would place the water before each dervish's mouth as he said, "Allah". Later, this be given to a sick person in the community to drink. At times the clothing of the sick person would be placed in the center of the circles to gain the "energy beams" of the zikr. By contemplating God's presence, Rumi's heart gained great warmth and made his presence a power which erased the ills of the mind and its adverse effects on the body. The written word of a man like Rumi became a charm, and when played an instrument, the vibrations which came forth into the air could heal. One day as he sat in his garden, Rumi was called to the house of one his disciples who was suffering from an intermittent fever. He took a pen and paper and wrote, "If you believe in God, the Most Great, make not the head to ache; vitiate not the swallow; eat not the flesh, drink not the blood; and depart from this being. I bear witness that there is no divine reality save God, and I testify that Muhammad is His servant and apostle." Then he washed the ink from the paper and gave the solution to the patient to drink (*). The man was immediately relieved of his illness. (*) in the sufi healing practice of writing sacred text and washing the ink for the purpose drinking - generally the text is written with saffron. often time ink of saffron is written inside a ceramic bowl as well. Once in the tekke, a dervish complained that the door made a disturbing creaking sound whenever anyone came into the room. 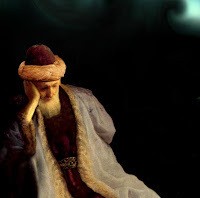 Mevlana looked at him and said, "The sound of a door opening is disturbing to you because all doors are closed to you. I love this sound, for all doors are open to me." Here Rumi's powerful statement is a glimpse of sufi mode of psychoanalysis techniques rooted deep in sufi healing techniques that help mirror / point to the shadows and faults of one's nafs (self) to 'work' on it.